An original letter of correspondence between brothers and business partners Joshua Coffin Chase and Sydney Octavius Chase. Topics discussed in the letter include Sydney's reading report of his visit to Isleworth Grove with Mr. Barger of the U.S. Department of Agriculture, research in developing mature color on citrus fruit peels in Florida, coloring arrangements made at Belair by Chase & Company in the past, a proposition to include Barger on a guarantee and commission basis at Isleworth, the poor market sales of grapefruit, and the slow output of Isleworth Seedlings. Original letter from Joshua Coffin Chase to Sydney Octavius Chase, November 26, 1921: box 49, folder 20.84, Chase Collection (MS 14), Special and Area Studies Collections, George A. Smathers Libraries, University of Florida, Gainesville, Florida. 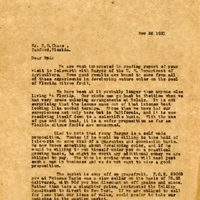 Digital reproduction of original letter from Joshua Coffin Chase to Sydney Octavius Chase, November 26, 1921. We are much interested in reading report of your visit to Isleworth with Barger of the U. S. Department of Agriculture. Some good results are bound to come from all of these experiments in developing mature color on the peel of Florida citrus fruit. We have been at it probably longer than anyone else living in Florida. Our minds can go back to thettime when we had very crude coloring arrangements at Belair. It is not surprising that the lemons came out of that intense heat looking like cooked turnips. Since then we have had our experiences not only here but in California, and it is now resolving itself down to a scientific basis. With the use of gas and not heat, it is a safer proposition as far as Florida citrus fruits are concerned. Glad to note that young Barger is a self made proposition. Wonder if he would be willing to take hold of Isleworth on some kind of a guarantee and commission basis. He now knows something about developing color, and if he would be willing to put himself under you on a practical growing basis, he might be worth any additional money we are obliged to pay. The time is coming when we will need just such a man in business and we do not want to miss a good proposition. The market is away off on grapefruit. F.G.E. 29069 now at potomac Yards was a slow seller on the basis of $2,25 delivered, with 50¢ per box discount on off grades and sizes. Rather than take a slaughter price, instructed the Selling Department to divert to New York. If we are obliged to sell for less than our ideas of value, would prefer to take our medicine in the auction market. closing down of grapefruit operations. We will endeavor to confine our grapefruit shipments to f.o.b. orders or prospects and also work the markets for orders for mixed cars of oranges and grapefruit. Note with surprise that the Isleworth Seedlings are only picking four boxes of oranges per tree. This is the smallest average we have ever had. Chase, Joshua Coffin. “Letter from Joshua Coffin Chase to Sydney Octavius Chase (November 26, 1921).” RICHES of Central Florida accessed April 20, 2019, https://richesmi.cah.ucf.edu/omeka/items/show/2738.